What Are The Best Shoes For Running On The Beach? What are the best shoes for running on the beach? 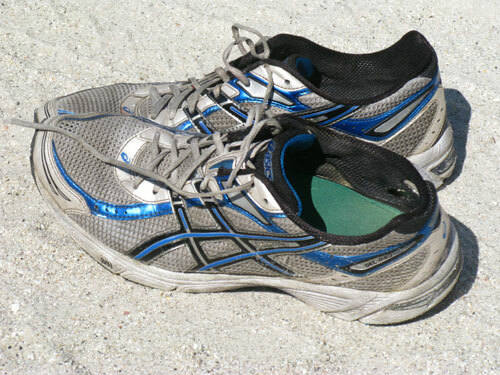 I recommend purchasing the sturdiest shoe you can, with little lateral movement, since beach running is so uneven and you are making adjustments with each step. As you can see, from the above picture, I use an old pair of Asics Gel -1140. Even after a couple of years, they are still in great shape. The one major difference you find between running on the beach, and running on pavement, is that the soles do not breakdown near as much. However, the "uppers" (the material that encloses your feet) really takes a pounding due to sand and salt water. This is where I usually see my shoes aging the quickest. No matter how hard you try, you will still mis-time a surge in the tide, and end up stepping in sea water several times during your training, each day. Everyone is different, but I selected my shoes because they were wide, straight-lasted (as opposed to curve-lasted), the arch support was superior to all others, and they have good cushioning. I like the wider soles because they provide more surface area for your foot strike. Trust me, there will be lots of places during your run when you will have to slow down and "run like a duck" due to the uneven surfaces of the sand. Just so you know, running on the beach has a lot of romanticism attached to it. When you see pictures in magazines or in TV ads, the people are striding along, without a care in the world. In reality, beach running requires you to be constantly vigilant...especially at high-tide when you cannot run on the hardpacked shoreline. Knees, hips, and ankles move around in planes you never even imagined in real-life running. The sand is full of continual dips, troughs, and elevated crests. Yes, they are small...but if you are not paying attention, you can get injured in the blink of an eye. I shop for the sturdiest shoe possible. Other guys are just the opposite. They get lighter shoes because they say they are able to lift their feet higher, and plant in a more gentle manner. It is all up to the individual. For me, wide, sturdy, high arch-support make the most sense. Are Vibrams The Answer As The Best Shoes For Running On The Beach? Some of my friends are starting to use "Vibrams" that were popularized by Mark Sisson in his ground-breaking book, The Primal Blueprint. I have not tried these, yet, so I really cannot provide you a quality review. I'm sure this makes the editors at Runners World cringe, but it works for me, and my beach running shoes last a couple of years. I also wash them in the washing machine every other month. This seems to help, too. I hope this short article helped you a little in answering "What are the best shoes for running on the beach?"